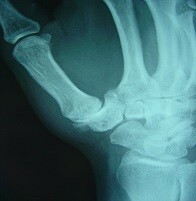 What is osteoarthritis of the base of the thumb? 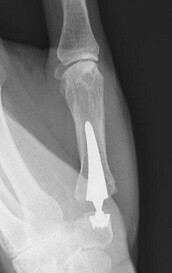 If this provides insufficient improvement of the complaints, in the case of osteoarthritis in the carpometacarpal joint alone, a prosthesis is proposed (CMC I arthroplasty). 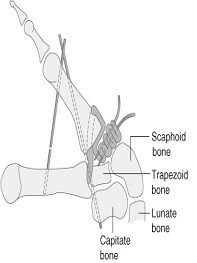 If the osteoarthritis has spread all the way around, a trapeziectomy with interposition of the flexor carpi radialis tendon is performed (according to Burton-Pellegrini). An arthroplasty or prosthesis replaces the original saddle joint with a ball and socket joint, fairly similar to a mini-hip replacement (socket-ball-shaft). In a Burton-Pellegrini procedure the trapezium bone is removed from the base of the thumb. The ligament between the first and second metacarpal is repaired and (part of) the flexor carpi radialis tendon is positioned where the bone was removed, as an interposition graft. 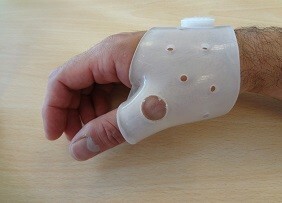 Both procedures require a four-week immobilisation period with a cast or a butterfly-type splint. The patient stays in hospital for one night. Loco-regional plexus or general anaesthetic are both possible. The rehabilitation period takes between two to three months depending on the expected strain.